I agree with the terms and conditions of Gamgos. To reset your password, enter your full e-mail address! Sending a new password is in progress.. 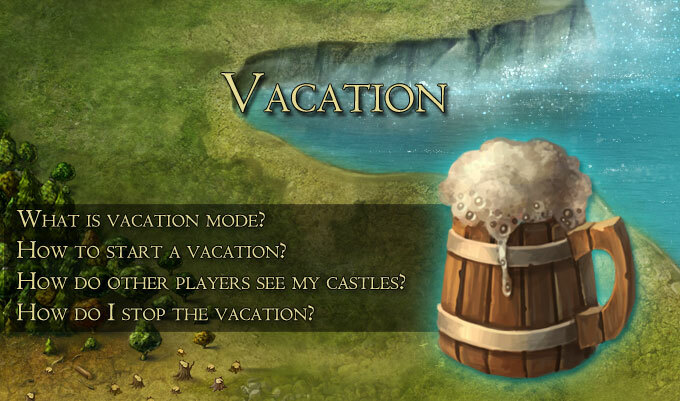 Vacation mode aims to protect players who wouldn't be able to log into their accounts for a certain time period. Friendly marches must be "returning" otherwise you can`t start the Vacation. 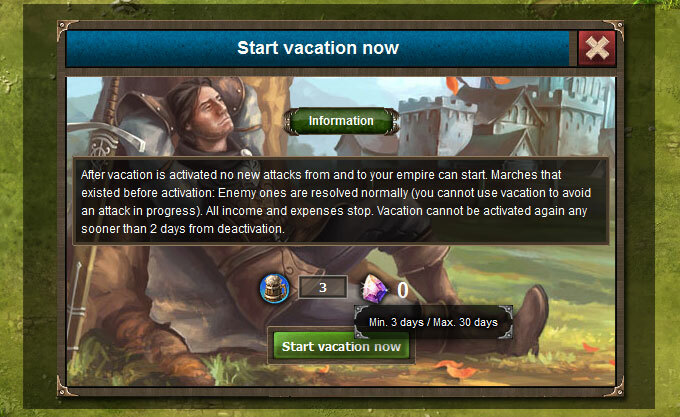 Enemy marches will be resolved normally - you cannot use Vacation to avoid an attack in progress. All income and expenses stop.Buildings, Researches, Armaments and units that are being produced will be completed normally. How to start a Vacation? The Vacation module can be accessed via the edit/view profile module. The icon can be found in the profile HUD. As you can see the minimum amount of days is 3 and the maximum is 30. .After you choose the number of vacation days you can hit the start button. Remember - Your first Vacation is on the house; From then on the Vacation days are paid in gems. Hitting the start button will take you to the vacation mode screen. 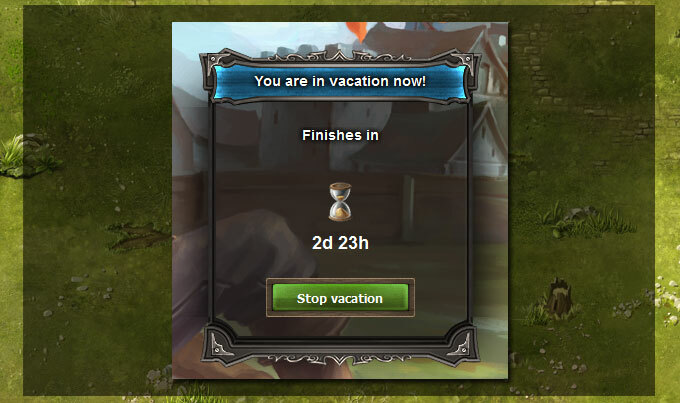 You will be shown the vacation screen and the vacation timer. How do other players see my castles? Enemies will know they cannot attack. In case they aren't familiar with the Vacation icon once they try to attack they will get a limited amount of actions to perform on your cities. How do I stop the vacation? You are free to stop Vacation at any point. Keep in mind that once deactivated You cant start another vacation for 2 days.